American Girl® Expands Into Construction Space For First Time With Premium Mega Bloks® Playsets For Girls | Mattel Inc.
MIDDLETON, Wis., -- American Girl, a premium brand for girls and subsidiary of Mattel, Inc. (NASDAQ: MAT), today announced it's expanding into the building category with its first-ever line of premium construction toys for girls 8 and up. The new products, developed in collaboration with Mattel's Mega Bloks team, feature highly detailed building sets and fully articulated mini figures based on the company's popular Girl of the Year characters, including past favorites Grace, Isabelle, Saige, McKenna, and Nicki. The Mega Bloks American Girl products are currently available exclusively at Toys "R" Us in the U.S. and Canada and will expand into other U.S.- and Canada-based mass retailers starting July 1, 2016. 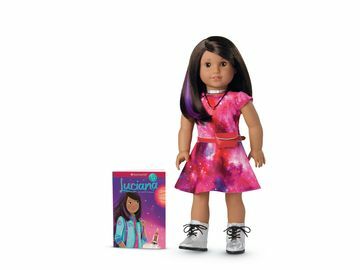 "We know girls are makers, creators, and doers, and they are looking for activities that fuel their creative and imaginative spirit," said Katy Dickson, President of American Girl. "Collaborating with another Mattel brand to create a premium and thoughtfully conceived construction line for girls allows for terrific synergy across the company and helps us encourage girls' creativity and self-confidence in a whole new way." "It is such a privilege to collaborate with American Girl in bringing these iconic characters and their stories to the world of building," said Bisma Ansari, VP Marketing of Mega Brands Inc. "Our building sets will encourage children to build the next chapter of their favorite American Girl story or create new ones!" 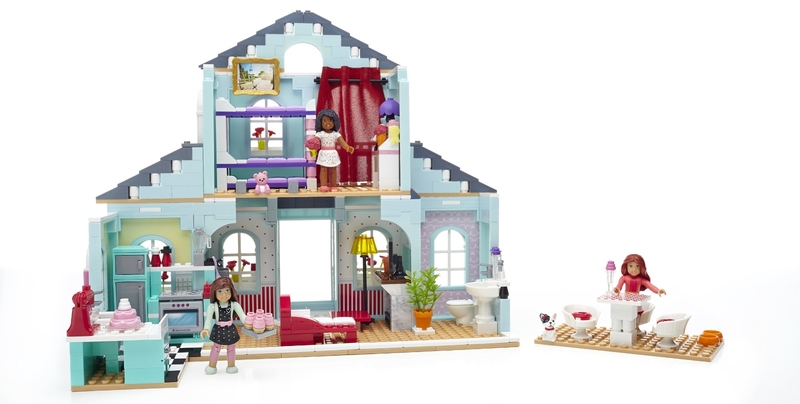 The new construction sets allow girls to spend hours reconnecting with their favorite Girl of the Year characters by recreating special moments from their stories. Each themed set features its own fully articulated Girl of the Year mini figure character, with realistic details and unique fabric elements, and comes packaged with a multi-page storybook with robust content and step-by-step building instructions. To extend the playability, the line also includes eight individually packaged American Girl mini friend figures, along with two style collections containing additional figures and mix-and-match accessories girls can use to further explore and expand the Girl of the Year story world. Grace's 2-in-1 Buildable Home ($69.99): The play options are endless with this deluxe 2-in-1 set, featuring 749 pieces. Girls can choose to build Grace's Home, her Patisserie, or a Slumber Party. Isabelle's Ballet Recital ($39.99): Girls can help Isabelle put on the perfect performance with this set that includes Isabelle and Luisa mini figures, a buildable ballet studio, a main stage with spinning floor, and a rehearsal area with real fabric details. Nicki's Horse Stables ($29.99): Nicki appreciates the great outdoors, and now girls can, too, by building her stable and a jump for her horse Jackson. Saige's Art Studio ($19.99): Girls can paint a masterpiece like Saige, with this buildable art studio with artist's easel, paint table, and real fabric details. Grace's Pastry Cart ($9.99): Baking is Grace's business! Girls can help her fulfill her dream with this buildable bakery cart, which comes with a cash register and other fun accessories. McKenna's Gymnastics Training ($9.99): Girls can help McKenna practice her routine with this buildable gymnastics set with high bar, winner's podium, and real fabric details. Uptown & Downtown Style Collections ($14.99): Each style collection includes accessories like hairstyles, skirts, purses, glasses, and hats to create three unique American Girl mini figures. Combine with other Mega Bloks American Girl playsets for additional fun. 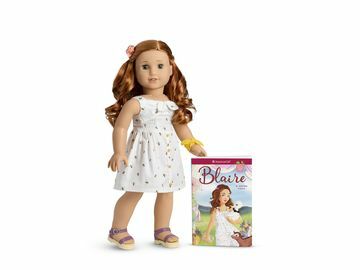 Collectible Figures Assortment ($3.99): Girls can collect eight highly detailed, fully articulated American Girl mini figures. Each figure is unique and comes with a stylish accessory and display block. The Mega Bloks American Girl products range in price from $3.99 to $69.99 and are currently available exclusively in-store and online at Toys "R" Us in the U.S. and Canada. On July 1, 2016, the line will expand into other mass retailers in the U.S. and Canada. For more information about the Mega Bloks American Girl product line, visit americangirl.megabloks.com. American Girl is a premium brand for and about girls and a wholly-owned subsidiary of Mattel, Inc. (NASDAQ: MAT, mattel.com), the worldwide leader in the design, manufacture, and marketing of toys and family products. Headquartered in Middleton, WI, American Girl offers an inspiring world of dolls, experiences, and entertainment to empower and unite girls of all ages. Best-selling lines include Truly Me™, Girl of the Year™, Bitty Baby™, and the classic historical character line BeForever™. The company sells products through its award-winning catalogue, on americangirl.com, in its experiential retail stores nationwide, and in specialty boutiques at select Indigo™ and Chapters™ in Canada and El Palacio de Hierro locations in MexicoCity. American Girl's mission is to fuel belonging and connection among girls, a goal that has already earned the loyalty of millions and the praise and trust of their parents and educators. A member of the Mattel family of companies, MEGA Brands Inc. is a trusted collection of leading global brands in construction toys and arts and crafts. They offer engaging creative experiences for children and families through innovative, well-designed, affordable and high-quality products. MEGA Brands includes MEGA BLOKS® and RoseArt®. Visitmegabrands.com and megabloks.com for more information. The MEGA logo, Mega Bloks and RoseArt are trademarks of MEGA Brands Inc. or its affiliates. The Mega Bloks American Girl Grace's 2-in-1 Buildable Home, featuring 749 pieces.